Poor planning, weak oversight and greed combined to soak U.S. taxpayers and undermine American forces in Iraq and Afghanistan, government watchdogs tell a new commission examining waste and corruption in wartime contracts. Since 2003, the Pentagon, State Department and U.S. Agency for International Development have paid contractors more than $100 billion for goods and services to support war operations and rebuilding. There are 154 open criminal investigations into allegations of bribery, conflicts of interest, defective products, bid rigging, and theft stemming from the wars, according to Thomas Gimble, the Pentagon's principal deputy inspector general. The Associated Press obtained the prepared testimony of Gimble and Stuart Bowen, special inspector general for Iraq reconstruction, in advance of Monday's first hearing by the Commission on Wartime Contracting. The commission will begin hearings on a year-long investigation into what happened to tens of billions of taxpayer dollars spent in Iraq on reconstruction projects. And Bowen's report documents case after case of waste, fraud and abuse, reports CBS News correspondent Russ Mitchell. After invading Iraq in 2003, the United States had a postwar plan for six months. It ended up being six years. 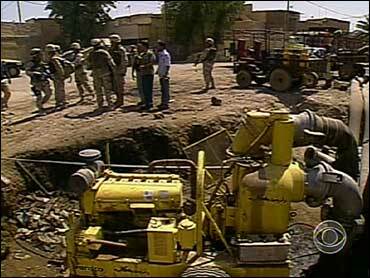 The Bush administration predicted only $2 billion taxpayer dollars would be needed to rebuild Iraq. The tab is $51 billion and counting - half of that amount was spent on private security contractors. The new report, "Hard Lessons: The Iraq Reconstruction Experience," finds the U.S. government "was neither prepared for nor able to respond to the ever-changing demands" of stabilizing Iraq. The report also says there were multiple shortcomings in the planning. For example, there were not enough troops to contend with the worsening security situation. And at the same time it was fighting a brutal insurgency, the U.S. undertook a huge reconstruction effort. Rebuilding water and sewage systems, the electricity grid, buildings, roads, airports, and ports fell on private companies. Much of the work was given to firms like Kellogg Brown and Root and Bechtel, which had contracts, which the report says, functioned like an open-ended checkbook. The report finds these projects were "grossly burdened by waste," Mitchell reports. At least 35 people have been convicted of criminal misconduct committed during the U.S. reconstruction program, according to the report. Bowen, author of the report, told CBS News the reconstruction plan went from "very narrow" to "enormous" in just three months after the fall of Saddam Hussein's regime. "It effectively became like building the airplane while you were flying it, and as a result, there was not the resources, there was not the structures, there were not the personnel to carry out so large a program so quickly," Bowen says. Styled after the Truman Committee, which examined World War II spending six decades ago, the eight-member panel has broad authority to examine military support contracts, reconstruction projects and private security companies. It is more blue collar than blue ribbon. The first members were not named until July; there still is a vacancy. They had no offices, no support staff and no work plan. The commission found space in an unassuming building in Rosslyn, Va., just down the road from the Pentagon. It has spent the last few months getting organized. The leaders are Mike Thibault, a former deputy director at the Defense Contract Audit Agency, and Grant Green, a former State and Defense department official. The panel has until August 2010 to produce a final report. Along the way, it can refer to the Justice Department any violations of the law it finds. Gimble and Bowen, in their prepared testimony, focus on different aspects of the wars, but with the same bleak tone. Gimble's office found that a small number of inexperienced civilian or military personnel "were assigned far-reaching responsibilities for an unreasonably large number of contracts." He cites an account tapped frequently by U.S. military commanders in Iraq and Afghanistan to build schools, roads, and hospitals. More than $3 billion was spent on these projects, which were not always properly managed. "In some instances, there appeared to be scant, if any, oversight of the manner in which funds were expended," Gimble says. "Complicating matters further is the fact that payment of bribes and gratuities to government officials is a common business practice in some Southwest Asia nations."